Heat stockpot with heavy bottom over medium heat about 5 minutes or until very hot. Spray stockpot with cooking spray. 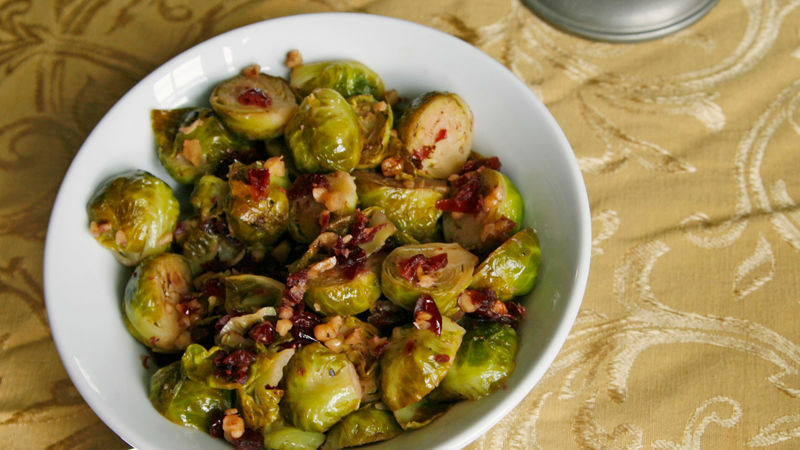 Add Brussels sprouts; cook 3 to 4 minutes, stirring occasionally, until lightly browned. Stir in wine. Add broth, salt and pepper. Cover; cook 5 minutes. Uncover; stir. Cook uncovered until all liquid has evaporated. Stir in butter, cranberries and walnuts. Once butter melts, cook 2 to 3 minutes longer. Remove from heat; pour into serving dish. Serve immediately. This can be made up to a day in advance. Reheat before serving. This recipe easily doubles for larger crowds.